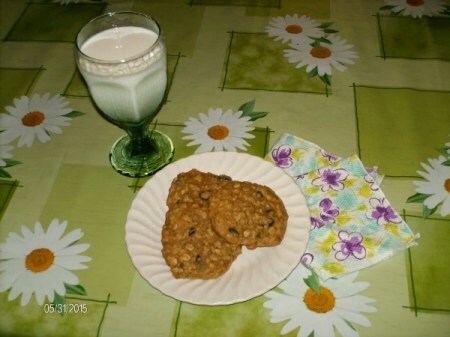 These are my spin on oatmeal cookies. 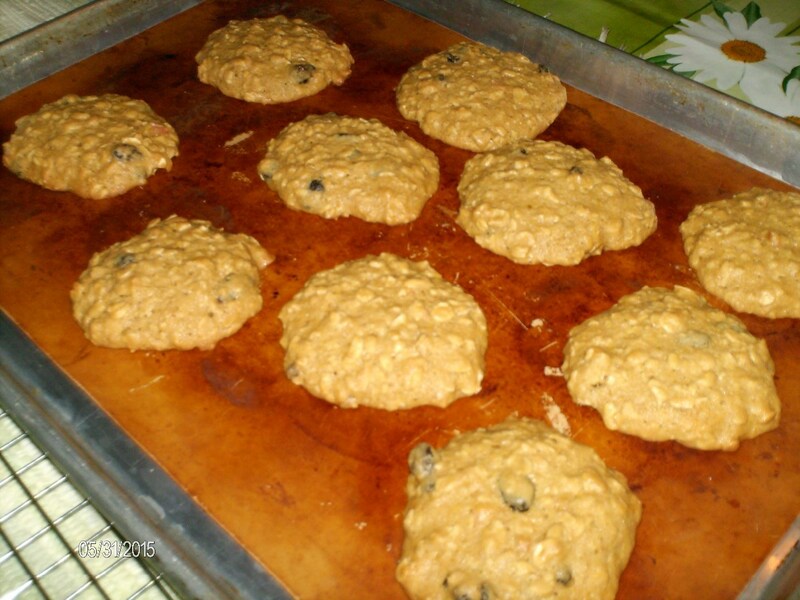 My Hubs loves them with the raisins, but I know others prefer chocolate chips or just plain. So the raisins are optional, or you could easily replace the raisins with chocolate or butterscotch chips (I have done both and they are delicious). They "disappear" really quickly at our house! Total Time: 10 minutes Prep time, 9 minutes per sheet to bake. Preheat oven to 365 degrees F. If your oven temp selector isn't digital, I'd use 350 to be safe (in which case you'd need to bake slightly longer). 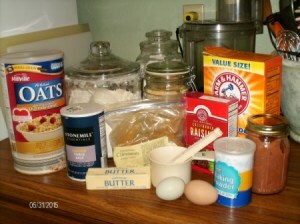 In a small bowl mix flour, baking powder, baking soda, cinnamon, and salt. Whisk together to combine. In a medium bowl cream butter (by hand or using a mixer) and brown sugar together. Add applesauce and mix well. Add egg and yolk and stir to combine. Add dry ingredients to the medium bowl and stir. Add oatmeal and chips, and stir to combine. Using a cookie scoop or a tablespoon, place cookies on a silpat-lined or greased cookie sheet roughly two inches apart. If you want bigger cookies, use a larger spoon and place farther apart, and pat them down a little in the middle so they will spread evenly when they bake. Bake at 365 F for roughly 9 minutes. The edges should be lightly browned. Let sit on tray for 30 seconds. Using a thin spatula, remove cookies to a cooling rack. These are a little bit crisp on the bottom, but soft and chewy everywhere else. We enjoy these with a cup of coffee or a glass of ice-cold milk. These look yummy, cute table cloth too! :) Thumbs up! Thanks Melissa! The tablecloth is vinyl by-the-yard. Easy care, and what I really love is that it's so cheerful! These have got to be good. They remind me of my own adapted recipe (which I haven't used in 50 years; I don't cook as i use to). The main difference is I added chopped pecans and chopped candied cherries. When the drones become a standard way of shipping, I sincerely hope you will send me a small, warm batch of these delicious looking cookies. Thanks Doug--we think they are pretty good. My daughter is going to make a batch today as I am still recuperating.